My older son and I are having a bit of battle of the wits. The weapon of choice – clean laundry! WHAT? Clean laundry? What battle could ensue from that? Well – when you have a nine-year old and a battle of the wits going on – it is really amazing what can come about. So – here’s what’s going on. Every week or so I do laundry. Upon taking everything out of the dryer, I fold and sort and place into individual stacks on my bed. As I am finishing up – I ask everyone to take up their own stacks and put away their clean clothes. I help my five-year old with the hanging stuff. Well – my nine-year old has taken it upon himself to make this not so simple. In fact, he keeps making it harder on himself. A few weeks ago, I discovered that instead of putting his clothes away, he instead threw all of them in the corner that is not easily seen from the doorway. A few weeks later, I discovered that he dumped all of the clean items onto the floor of the closet. This morning after I asked him “did you put your clean clothes away yesterday” and his answer was a puzzled look….I got suspicious. So what did I find when I asked him what he was going to wear today and opened up his closest door to see – – – an empty closet with no clean clothes! This time he had hidden all of the clean clothes in the closet again, but also took the time to hide them under an old beanbag chair and an old Halloween costume. I calmly told him to get to work putting everything away. I stood there for a bit and watched him to make sure he did in fact put them away this time. His reply – “put my clothes away the first time”. To which I explained that he’s only putting off the inevitable. Knowing we’ll eventually have to do whatever the task is – – I do it too and I’m 41! Categories: Random Thoughts | Tags: battle of the wits, clean clothes, laundry, little boys, putting off the ineviable | Permalink. The Law of Diminishing Returns – – da da daaaaa (dramatic music plays). 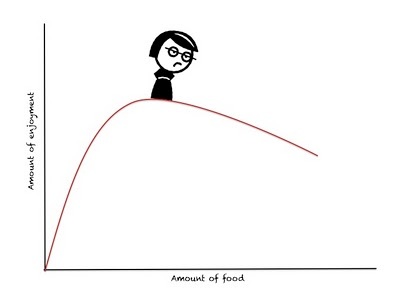 What in the world is the Law of Diminishing Returns? Actually, it is a pretty simple concept, it’s the finding of the balance that is the hard part. Definition: The Law of Diminishing Returns – (n) – The tendency for a continuing application of effort or skill toward a particular project or goal to decline in effectiveness after a certain level of result has been achieved. The most common example of this law is that of fertilizer. Imagine you plant corn in a 200×200 plot. You plant the appropriate number of seeds per row and appropriate number of rows per the plot. You tend to it by watering it, keeping it free from weeds and birds and your payoff is a modest yield of corn. The next year, you do everything the exact same way, but also add 1 part fertilizer to the mix. You see your yield double. The following year, you increase your fertilizer by one additional part, your yield triples from the first year. The following years, three, four and five, you incrementally increase the amount of fertilizer you put on the plot, but now your overall increase starts to decrease from the first year. Here’s the point – keeping all things equal and only increasing (or decreasing) one factor, there is a point at which the output will level out and eventually start to decline because of this increase. Let’s say you are a small business owner, you are a marriage counselor who sees clients on a weekly or monthly basis and you are trying to increase your gross income. The obvious way to increase your income would be to increase the amount of couples you work with each week or month. And while this works for adding one or two more clients each week, BEWARE – there is a point when the increase outweighs the income. Things to consider – are you physically capable of adding more and more clients to your daily schedule. What sort of price does doing so cost? Consider your overall health, your required rest needed to be fresh and mentally alert for each client meeting. Don’t forget the added work that needs to be in the form of reports written, insurance claims, invoicing, etc. The important thing about the Law of Diminishing Returns is to find the balance of where the maximum amount of input produces the maximum amount of output. Just remember – adding more and more to your plate, won’t always produce more and more income. Because I like to apply business terms to your home management system, how’s this example. Imagine you do laundry every week (or maybe this is your reality and no imagination is required). Every week you do laundry for your family of five and it breaks into 15 loads. Finally, you are able to upgrade to one of the new fancy and extra-large capacity washer and dryers. With these new machines, you are able to increase the size of the loads and cut that amount down by a third. But you didn’t figure out the magic number was ten until you tried increasing the size of the loads so much that at some point the washer was shutting down or the clothes weren’t getting as clean – merely because the washer was packed too full. Just like at home – it’s all trial and error and that’s what makes running your own business or managing your home so exciting. You have that control over your destiny and the fun and challenging part is getting to figure it all out. One last important reminder – don’t be afraid to try things, just because you are afraid of diminished results. For our counselor example – OK – so he overbooked himself one month and had a crazy/ultra hectic month. Lesson learned – too many clients makes him cranky and overwhelmed. Next step, reduce by 10% and see how that works, and again and again until he finds the right balance that works for him. Good luck. Are you struggling with ways to make adjustments to your business to find ways for increasing your income or decreasing your workload? Give me a call – let’s chat about it. Categories: Business to Personal, Word Up Wednesday | Tags: increase income, laundry, law of diminishing returns, marriage counselor, small business owner, the law of diminishing returns | Permalink. It is almost New Year’s Eve – the countdown has begun. I am actually looking forward to the calendar turning, starting fresh and new in the New Year. Are you making any New Year’s Resolutions? Care to share them with me? Last year my resolution was to return all the grocery carts back to the safe zone or walk it back to the entrance instead of leaving it by my car. My mom was astonished that I did that at all, seeing that my sister was a bagger at a local grocery store while she was in high school and college. She would tell stories about how she would get stuck outside for hours of her shift chasing down grocery carts and bringing them back to the store. I’m happy to say, I did really well on my goal for last year. I don’t think I missed one time of not putting the cart back in the correct spot. This year, I’m a little more reluctant to take on the goal that has planted itself in my head. Put all the clean clothes away on laundry day and stop living out of the baskets all week-long. This one is going to take some real determination and will power for sure. Remember when I wrote about it –Laundry Tips– – maybe I should implement my own tips. Create goals that are challenging yet doable. Create a system to make them happen. What is that Albert Einstein saying -“insanity is doing the same thing over and over and expecting different results.” Resolutions are about change – but nothing changes on purpose without a plan. Find a way to keep yourself accountable. 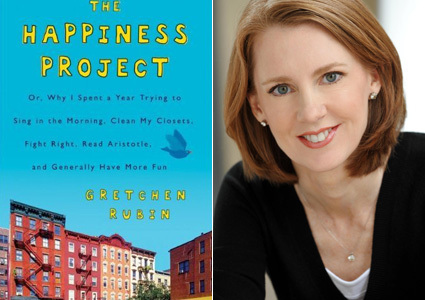 I follow Gretchen Rubin of the Happiness Project and she wrote about the same thing a couple of days ago. I thought I’d share her blog here – Making New Year’s Resolutions? Ask Yourself 6 Questions. I found it quite helpful and right on. 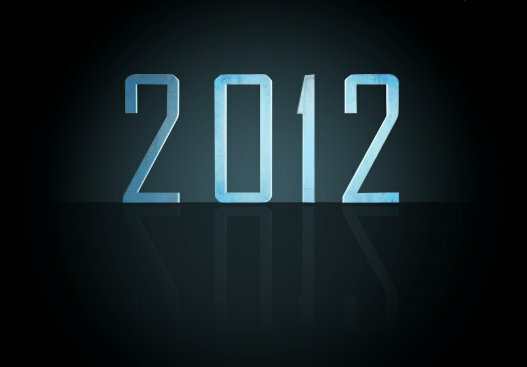 I do have some other things planned and in the works for 2012 for both this blog and some other projects. I’ve been taking this week lighter and will share all those with you next week. Until then – thanks so much for reading this year. I hope you’ve found my thoughts and tips helpful. I’ve enjoyed writing them and hearing from you too. Categories: Random Thoughts, To-do | Tags: 2012, gretchen rubin, grocery carts, happiness project, laundry, New Year's, resolutions, setting goals | Permalink.